Early Tax Refund Anticipation Loans: Should You Get One? 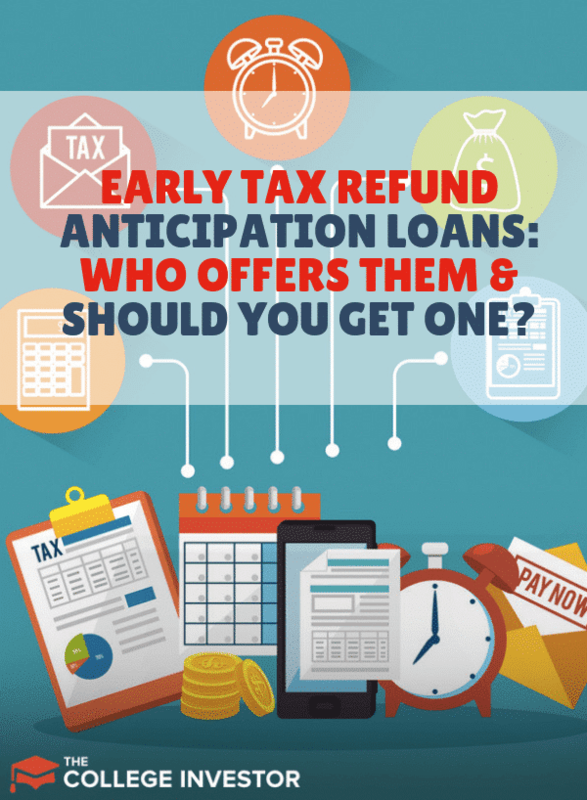 Home » Early Tax Refund Anticipation Loans: Who Offers Them and Should You Get One? If you’re like me, tax season couldn’t come soon enough. You’re either gearing up for a refund or you’re organized and ready to put tax season behind you. 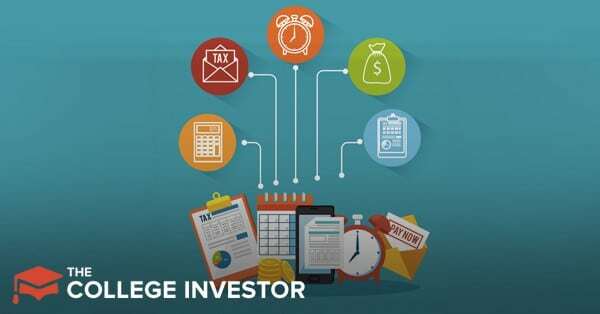 If getting a refund is the reason you’re ready for tax season, then you’ve probably heard of early tax refund anticipation loans. If you’ve been debating whether or not to use an anticipation loan here’s what you need to know. Note: Our main thought on these loans and products is NO. But we're also not your mother, so at least get educated on what you need to know before you take them on. Before you read on, make sure you check out our tax refund calendar so you know when you could potentially expect your refund. It might make more sense to wait than to get a loan. Now onto the tax refund anticipation loan stuff. If you just need a loan today, and don't want to wait, check out recommend shopping for a personal loan on Credible. Credible is a comparison site, where you can see what different options you might qualify for online - in just 2 minutes. You can borrow anywhere from $1,000 to $50,000, with APRs as low as 4.99%. That's a great deal (especially when you look at something like Emerald Advance). You can also check out our guide to the best personal loan. Can You Get A Refund Anticipation Loan With Bad Credit? Who Offers Refund Anticipation Loans? What Can You Do To Speed Up Your Tax Refund? An early tax refund anticipation loan is a loan that you get from a tax preparation service instead of waiting for your refund to come. These loans can be given as early as the day your tax return is accepted by the IRS. (Which is about 3 weeks sooner than waiting for the IRS refund.) They normally have tax preparation fees deducted from them and may come with other fees for taking out the loan. These loans are popular since they can help taxpayers receive their refunds early. Anticipation loans are generally given out by a special debit card, check or direct deposit. Note: Be very careful when getting a debit card or gift card. If you enter the wrong information or email, your refund can be "lost" and it can be nearly impossible to get your money back. When your actual tax refund is available, the check will be sent to the tax preparer who gave you the loan, automatically paying your anticipation loan back. I do not recommend using your tax refund for a cash advance or to fund any type of refund anticipation loan. As you will see below, they are expensive compared to other options available. Furthermore, some unscrupulous tax preparers may charge higher fees than they are allowed to (or even hidden fees or interest). You need to do your due diligence! If you're in a pinch and think this is the only way, be smart about your choices. Many people looking for a loan might be better served by one of the options on our best personal loans list. Good question and the answer is: it depends. There are some companies who claim to give anticipation loans without a credit check (like Jackson Hewitt, for example) others will require credit checks and some may charge higher fees if you have bad credit. If you’re planning on getting an anticipation loan, your best bet is to simply call and ask the tax prep service provider you plan on going to about the details beforehand. Thanks to refund anticipation loan regulations over the past few years, many of the companies who formerly offered refund anticipation loans no longer do. This is good for consumers, as the expensive loans that preyed on low-income families are now obsolete. However, there are some companies that do still offer anticipation loans, although they look much differently than the expensive ones of the past. TaxSlayer - TaxSlayer will be offering their TaxSlayer Refund Advance loan again in 2019 for the amounts of either $500 or $1,000. They are free for anyone who files with their Classic edition or higher tax service (which is only $17 for Federal this year). The great thing about this loan option is that it's all online! Check out our full TaxSlayer review here. Liberty Tax – Liberty Tax offers easy advance loans in the amount of $500 - $1,300 for tax payers who qualify. These loans are secured by your tax refund are available in the form of a check printed in the office, prepaid MasterCard or direct deposit. Check out our full Liberty Tax Review here. These loans are available Jan. 3 – Feb. 28, 2019 (so they are no longer available). H&R Block Emerald Advance – H&R Block seems to have departed from traditional refund anticipation loans and now offers the Emerald Advance starting as early as November each year. The Emerald Advance is a line of credit of up to $1,000 issued before the Christmas season and that must be paid back by February 15th the following year. As long as the loan is paid back by Feb. 15 then loan holders may be eligible to keep their line of credit for the entire year. It’s important to note that the H&R Block Emerald Advance is much riskier than a traditional anticipation loan as it is a line of credit with interest and NOT a one-time loan secured by your tax refund. Have you ever thought about simply getting a personal loan? I know this might sound a bit weird, but you might get more money, a better interest, and an all around better deal. A personal loan can be a great way to pay off high interest credit card debt, consolidate multiple loans, get your car or house fixed, and more. The helpful feature about these loans is that you have a set payback period - versus having to do your taxes and then waiting for the return. We recommend shopping for a personal loan on Credible. Credible is a comparison site, where you can see what different options you might qualify for online - in just 2 minutes. You can borrow anywhere from $1,000 to $50,000, with APRs as low as 4.99%. That's a great deal (especially when you look at something like Emerald Advance). Check out Credible and see if it makes sense for you here. If you insist on getting a tax refund anticipation loan, please perform your due diligence. Go for the fee free loans of up to $1,300 and by all means stay away from the lines of credit and all other loans that charge fees and hefty interest. File Early – You can file your taxes as early as Jan. 1st although we estimate that the IRS won’t start accepting returns until Jan. 29, 2019. You can use a tax prep service or file online through one of these places. Don't Forget About The Delay For EITC and ACTC - If you are filing with the Earned Income Tax Credit or Additional Child Tax Credit, your return will automatically be held until February 15 to be processed, so you likely won't even get your return until late February or early March. Have All of Your Information Together – Before you file make sure you have everything that you need. Impatience could cause an error on your part and delay your tax refund. Here’s a list of items you’ll need to file. File Electronically – Filing electronically is much quicker than filing a paper return and should result in a faster refund. Remember, if you file by mail, you have to mail in your return (takes about a week), and the IRS has to manually put it into the system (adds about 3-4 weeks). Filing by mail typically adds 4 weeks to your original 21 days if you e-file. Use Direct Deposit – Using direct deposit is the quickest way to receive your tax refund. If you opt for a check, you're only adding time to get your refund. The IRS has to send your information to the check printers, and then they mail it to you. That process adds at least a week to your refund. Tax refunds are typically given received within 21 days of your tax return being accepted which means you could receive your refund via direct deposit as early as February 20. Although due to a new tax law you might not see your refund until a few weeks after that date. If at all possible, wait for your tax refund to come in from the IRS. If you absolutely need to your refund early, opt for a fee-free loan and stay away from the lines of credit. Do you use an anticipation loan? If so who do you prefer to deal with? Thanks for posting this. Tax anticipation loans are one of the worst financial products out there and should be avoided at all costs. We agree, but we also aren’t people’s moms. There will inevitably be people looking for these products, so they should do it the right way if they do. What’s the qualifications for being approved for h&r blocks new refund advance that starts today? ?I claim one dependent and usually get back few thousand+ and I should this year..I’m sceptical as they claim u won’t know until the day AFTER u have to file (&they’ve made their hundreds for filing taken outta my refund)?? I couldn’t find anything. In general, though, you’ve already waited a year to get this money, it’s typically better to just wait the 21 days for your refund and not lose anything to fees. If you’re getting a big refund, you could always change your withholding to get more each paycheck. Trying to figure out myself….I filed the last nine years at Liberty. Been approved for the loan up to $6250. This year I am getting over ten thou and I was not approved for the loan. Never have I not been approved. Guess things are stricter this year. If you get an advance from one place do I have to file with the same preparer? Yes, because the tax preparer is the one lending you the money. But what if you do not spend that money? Jackson Hewitt began my refund based on my check stubs. I was able to get a $200 loan but because I didn’t agree with the refund amount, I told them I was going to file else where. I still have a card with $200 on it, what do I do? You need to pay it back. If that was part of a loan, you likely signed something for it. Or are you sure they didn’t cancel the amount on the card already? Every place is different, so I couldn’t tell you. Some places pre-approve and then the loan amount is based on your refund. Other places wait until your taxes are complete and let you know if you’re approved. Did you receive your loan via direct deposit or prepaid card? How long did it actually take for you to receive the funds? I couldn’t tell you the reason – what did they state was the reason? Liberty tax easy loan is a scam! I filed my taxes on the 23rd and was trying to get the loan after paying over 450 dollars. I prequalified at Jackson Hewitt, never had an issue with my taxes, have good credit but I as denied but here is what happen, I get a call about 2hours after filing from a cell phone saying one of our child’s ss # wasn’t right by 1 number and my son’s last name had an extra letter in it which I told him twice and it was fixedbefore I signed. About an hour or 2 later I get an email saying I was denied. Here’s where I started to get suspicious, apparently the exact same thing has happen to about 4 people so far. It also come to my knowledge that in small print on the bottom of the last page that the office you filed in actually has to pay a fee for every loan that is approved! I’m assuming that’s why a lot of people are being denied. I called the bank it’s through and they that there are no funds with my name on it and in fact no info of me at all?? Just think it’s ridiculous I have to pay 500 dollars (no deductions, just my info,my kids info and that’s it) to file my taxes when every other year I’ve done my own for less then 50 dollars. He was so nice to help us but as soon as he got our money all that changed, rude and very short with me. I believe they have set amounts they will lend you before your refund comes. You need to ask your tax preparer about the difference if you’re concerned. You should contact Jackson Hewitt and find out. Do you have to file with the same company the previous year just to qualify for a advancement? Can you get a tax refund anticipation loan if you have to paper file and if so where please. You would have to confirm with one of the major tax prep companies like H&R Block or Jackson Hewitt. Yes, you can get a tax refund anticipation loan from these firms. Great call – you shouldn’t get an anticipation loan unless it’s free and you really need it. Honestly, the 21 days isn’t that long to wait. Anyway, you never have to file with them again if you don’t want to. You can file anywhere you’d like! We recommend your do it yourself online with a free company here: Best Places To File Taxes For Free. 95% of people can easily do it themselves. So would I just call the local office and tell them to shred my paperwork and I’ve decided to go elsewhere? Did you finish your return with them somewhere? If you didn’t even finish (or it was past years), you don’t need to call them. Yes, if you took a loan, you still owe it regardless of whether you got your tax refund or not. Can you recommend a company that will issue a tax refund loan/advance if my credit is bad? TaxSlayer should base your loan on your refund. You could also go into a branch as mentioned in the article, but it’s not recommended due to the cost. The best bet is to file your return ASAP and wait the 21 days. It’s not a long time. If you have already got one loan from the tax preparer can you get another one? Not likely, but you can look for a personal loan if you qualify. H & R Block now does a Refund Anticipation Loan of up to $3,000 with no fee and no interest. The catch is that it is loaded onto their debit card. No fee for using that to make purchases at stores or to get cash back at most stores. You will probably be notified on Monday. Since I was denied the anticipation loan, will I receive my regular income tax in 21days??? It depends on what you claimed on your return. If you have the EITC or ACTC, you’ll be waiting until end of February. Otherwise, see this calendar: Tax Refund Calendar. For those wondering if Tax Slayer uses your credit, they do. I just spent the last two hours scouring the internet to find the answer and couldn’t. I found it in the agreement section.